Tennessee state troopers arrested John McAfee, self-described "eccentric millionaire," for DUI and possession of a handgun while under the influence. John McAfee is in trouble. In Tennessee. 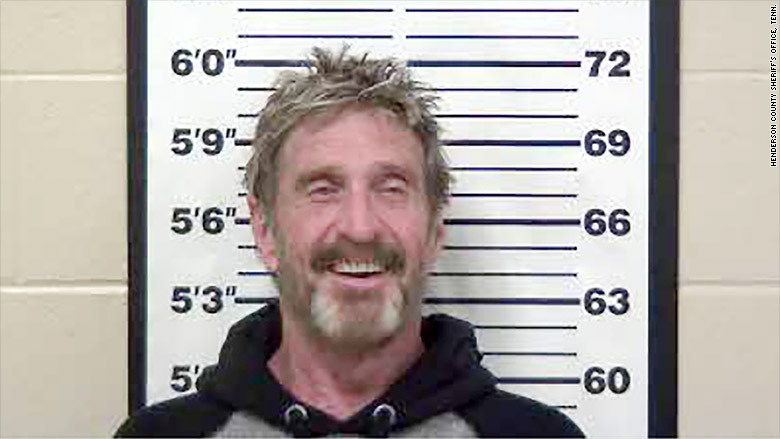 McAfee, the antivirus software superstar from California who fled police in Belize, was arrested in Tennessee for DUI and possession of a handgun while under the influence. McAfee was arrested by the Tennessee Highway Patrol, said Sheila Austin, warrants clerk for the Henderson County Sheriff's Office, who confirmed that he was the McAfee. "I don't know why he would move to a little town like ours," she said. Beverly Dunaway, court clerk for Henderson County, said he's a resident of Lexington, Tenn., which is in the western part of the state between Nashville and Memphis. He was released on $5,000 bond. The troopers were not immediately available for comment. He's had a turbulent life, to put it mildly, since he sold his McAfee antivirus software company to Intel in 2010. He named the company after himself, but Intel (INTC) rebranded it last year as Intel Security, because the name McAfee had become synonymous with outlaw. A self-described "wealthy eccentric," McAfee lost most of his $100 million fortune in the 2008 market crash. McAfee was living in Belize in 2012, when the police came looking for him to discuss the murder of his neighbor. He fled the police, and the country. He said he was innocent, and police raided his jungle compound, which later burned down. "Everything I owned was in Belize," he told CNNMoney in an interview last year. "I left with nothing in my pocket." He moved to Montreal, where he lived with his wife Janice, before moving to Tennessee. He now has a company called Future Tense Secure Systems.